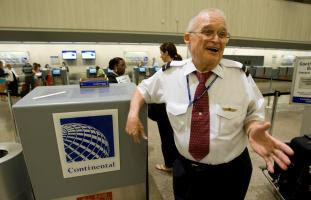 Ray Hope (pictured at right) made his final flight as a Continental Airlines flight attendant this past Friday. He thought it was time to retire; he will be 80 years old in August. According to a Houston Chronicle article about Ray Hope, this is his second retirement. Before he became a Continental Airlines flight attendant 16 years ago, he had a 40 year career as a commercial photographer. Mr. Hope, whose daughter has been a Continental flight attendant for 22 years, was in his sixties when he applied for the cabin crew job. He told the Houston Chronicle that he had "some good days and some bad days." But the experience taught him patience, he said. "It's just a good experience of meeting people and communicating with them," Hope said. "I think it's the best choice I've ever made in my entire life. I wish I would have done it sooner." He called being a flight attendant a "rewarding job" that he hated to give up, but he felt it was the right time to do so. The almost-80 year old now plans to spend time with friends at a retirement community, making wooden toys for children in Child Protective Services. He jokes, though, about a possible third career as a Wal-Mart greeter. The Houston Chronicle quoted Ray Hope's daughter, Diane Peckham, who said of her father, "He's not one to relax very easily. He's always one to do something." Best wishes to Ray Hope for his retirement years. 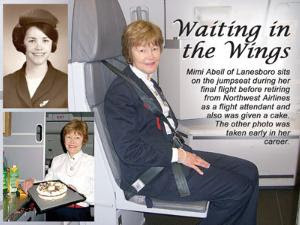 Congratulations to Norma Heape, the number one flight attendant at Continental Airlines. Today she celebrated 50 years of service with the airline. Continental will honor Heape's 50 years of service in a brief ceremony on June 13 prior to her departing on flight CO99 from Newark Liberty to Hong Kong. Risoli will present Heape with a specially designed necklace in recognition of her lifelong dedication to the airline. With the most seniority among nearly 9,000 flight attendants at Continental, Heape sets a great example for her peers. Not once in her career has she missed a scheduled trip due to calling in sick. Ms. Heape first signed on with Continental in June 1957, before the airline had jet-powered aircraft in its fleet. During the course of her career, she has flown over 26 million miles on 27 different aircraft types to nearly all of Continental's more than 100 destinations worldwide. She has been based in Houston, Denver, Los Angeles, Honolulu and Newark. 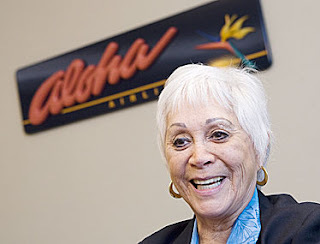 Among the "firsts" to her credit: she worked the inaugural flight of the Viscount aircraft in 1958, Continental's first military air charter in 1964, and the first Boeing 747 flight to Honolulu in 1970. Best wishes to you, Norma. May you have many more happy landings! Two of the women who will graduate this week from Alaska Airlines flight attendant training are a mother and daughter. Summer Braaten and her mother Beth both will receive their wings tomorrow. According to a story in the Seattle Times, this is the first time Alaska Airlines has trained a mother-daughter team together. Matthew Coder, manager of Inflight Services Training for Alaska Airlines said, "We've had sisters together, and husbands and wives, but not a mother-daughter. What usually happens is the daughter goes through the training first and they like their jobs so much, we get the mother later." Encouraged by a supportive spouse and friends who are flight attendants, Beth Braaten applied first. "I wanted to be a flight attendant since I was a little girl. It never went away," said the 46-year-old interior designer. "A year ago I decided to pursue the dream." About the same time, Summer Braaten, who graduated from Central Washington University in 2006 with a degree in tourism and hotel management, was working in catering. On a job, she met an Alaska Airlines recruiter. "It was mom's dream, but it sounded like fun," said Summer, 23. She applied in March, two weeks after Beth. Both were accepted and scheduled for the same training class. Following graduation, both women will be based in Anchorage. "I never imagined when I held Summer in my arms my first Mother's Day [in 1984] that we'd ever be doing something like this together." Beth said. "Our graduation is a perfect Mother's Day gift." Happy Mother's Day, Beth. And good luck and happy landings to the new flight attendants. To read the entire Seattle Times story about Beth and Summer Braaten, with more photos, click here. The Chicago Tribune has an article today about the history of flight attendants that is worth reading. Its title, Skies often were overly friendly, may give you a clue to what it's mostly about: Sexism. In the 1960s and '70s, flight attendants unions used the Civil Rights Act of 1964 to initiate some of the most significant shifts in the profession. For starters, union contracts of the era began replacing the term "stewardess" with its unisex substitute, "flight attendant," reflecting the fact that greater numbers of men were entering the field. Through negotiation and litigation, the no-marriage rule, no-pregnancy requirement and age restrictions were struck down, and body-weight policies were liberalized. In the 1960s and '70s, when airlines were competing to lure male business travelers, they sought to capitalize on the attractiveness and attentiveness of their flight attendants. National Airlines launched its sexually suggestive "Fly Me" ad campaign, and Braniff International Airways unveiled its "Air Strip" marketing ploy, which featured flight attendants peeling off layers of clothing in the aisle. "The '80s and '90s saw the shift back to professionalism in public perception, and after 9/11, I think people recognize that the flight attendant's primary role is safety, not serving lunch," [author Johanna] Omelia says. "I think the airlines downplayed our safety duties prior to 9/11 so people wouldn't focus on potential dangers," [AFA historian Georgia Painter] Nielsen says. "Heaven forbid that the public think flight attendants do more than serve you the best martini you ever had." The article winds up with a timeline citing major events in the history of flight attendant profession. Read it in today's Chicago Tribune.